An Artist`s Gallery overlooking Ellis Square. Fine Art Photographic Prints from Digital Images covering Savannah`s historic district and Bonaventure Cemetery. Glass Studio Stained Glass Art on Tybee Island. Pamella`s passion for color and design shine through in her watercolor renderings of Savannah`s historical architecture. 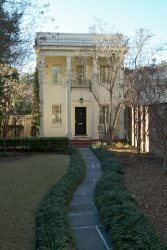 Located in Savannah`s historic district, plan to visit this fine gallery on our next trip to Savannah. Savannah College of Art and Design web site with a variety of scheduled exhibitions at different venues. Nature is a cathedral where Divinity speaks in moments of beauty and inspiration. Tiffani Taylor transforms these moments into rich, textured paintings and original pottery. Lush and vibrant, Tiffani�s art is a tribute to things the eye cannot see: the journey of life; inner beauty; feelings of gratitude, reverence, and appreciation. The A.T. Hun Gallery, "where the brush is mightier than the sword". Savannah`s best outrageous Art Gallery. Beautifully handcrafted jewelry by local, regional, national and international artisans. Now representing over 35 different artistans, We are known for our great selection and great prices. Come see! Combining welding, blacksmithing and self-invented techniques, Chase creates unique metal sculptures that capture the beauty of true island life.